King Shaka - 1816-24 - the first Zulu King, is credited with inventing this type of spear - and in doing so, changed the way battles were fought between African tribes. Until that point the shield was carried in the left hand, and the spear in the right. They also used battle axes and knobkerries. However, until Shaka , the right arm was raised in the air to strike downwards. This exposed the whole of the right side of the body - but, whilst every body else fought in this way , it wasn't important. Shaka changed this by having the Iklwa - still in the right hand - but used in a short forward stabbing action. The blade only needed to go in 3 or 4 inches ( 7.5cm - 10cm.) to cause death. This changed the face of warfare in Africa and made the Zulus the pre-dominent tribe. 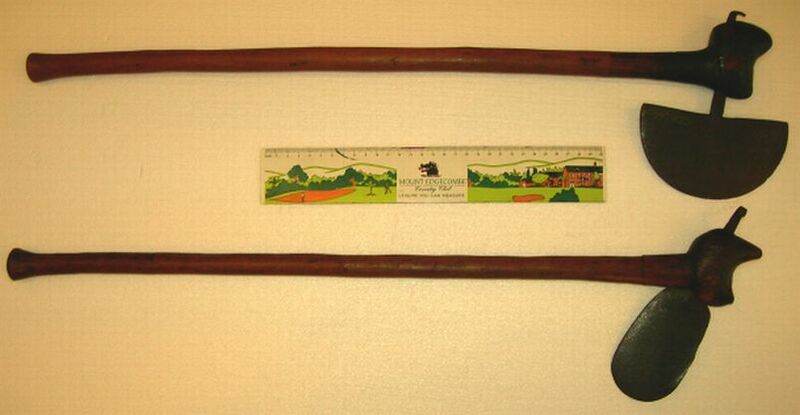 The length of an Iklwa could depend on the whims of the owner - some were very short and others up to 5 feet (150cm) - this good example ia approx. 3.5 feet overall (105cm) and the blade section is 17 inches (42cm). I show in an earlier post on this sub-forum, how the Zulu smithy's forged iron - you can see on this blade how it was beaten out to either side and just above the binding are the two pincer marks where it was held. The binding is cut from a cow's tail and pulled over whilst wet. After a while it sets like iron. The shaft is a local wood and flare at the end - this gives a grip to pull it from a body with bloody hands ! Shaka set very strict rules and the hands of his warriors were examined after a battle to make sure they had blood on them - failure in this could cost their lives. We all have our own opinions and for myself I don't think Shaka just came-up with the idea. The Roman gladius allowed their army to fight in just this way - and made them the pre-dominent military force for hundreds of years - until the tribes they fought learnt not to raise their right arms. The first European contact that Shaka is supposed to have had was with the British - however, the Portuguese had a colony in what is now Maputo (Mocambique) and I feel a Missionary probably made the trip to see Shaka and told him about the Romans. I don't suppose we will ever know - but it seems plausible. I will continue the other Zulu thread on their artefacts - but, will add further spears and weapons to this one. I hope it is of interest ? Excellent topic, Mervyn. Do you know what Zulu spears were supposed to have looked like before this type developed? Do you know anything about their production? How is the shaft attached? As always a very interesting and informative post Mervyn. Please do continue to post more information regarding the Zulus and their culture. And, apparently, the traditional 'cry' [shout] after a fatal thrust with the spear was "I have eaten!". A very intimidating bunch of warriors indeed. The earlier ones were not so elongated in the head - they were in fact similar to the hunting spears. Iron occures naturally in Natal - in fact one of the mountains where fighting took place in 1879, was Hlobane (shlobarn) - this was where Sir Evelyn Wood V.C. took a force to punish the local tribe and found himself cut-off by 20,000 advancing warriors. He retreated back to his camp at Kambula and the following day defeated the Zulus - our first success. However, I was going to say that Hlobane is over 5 kms. long and is of the finest iron ore. I'm told that it could supply the World for 20 years - which is why the Far Eastern countries - particularly China - are trying to get a hold on Africa. The spear head is beaten with a tang and this is inserted into the top of the shaft through a small bored hole. The top of the shaft is then bound to make a very firm join. There are three ways of binding - the cheapest was to use the centre stalk from an Ilala palm leaf, this would be woven with a depth of up to 8 inches from the top. Over years this also sets very hard, but it does fray and is then renewed. The most common is a section from the tail of a cow - pulled on whole like a condom. Again this sets very hard. Later, when the Zulus had made contact with the Portuguese in Delgoa bay, they established trade - ivory and skins for manufactured items, like brass and copper wire. I think it must have been on rolls like our old picture wire. Once woven into a decorative design they would take a heavy stone and beat it flat. With a plentiful supply of iron ore the guild of Zulu smithys found that they could use a green stone from the riverbeds to act as both a hammer and an anvil. This is a form of green dolomite - or, residual volcanic stone - very hard. This group photo shows the difference in sizes of various spears. 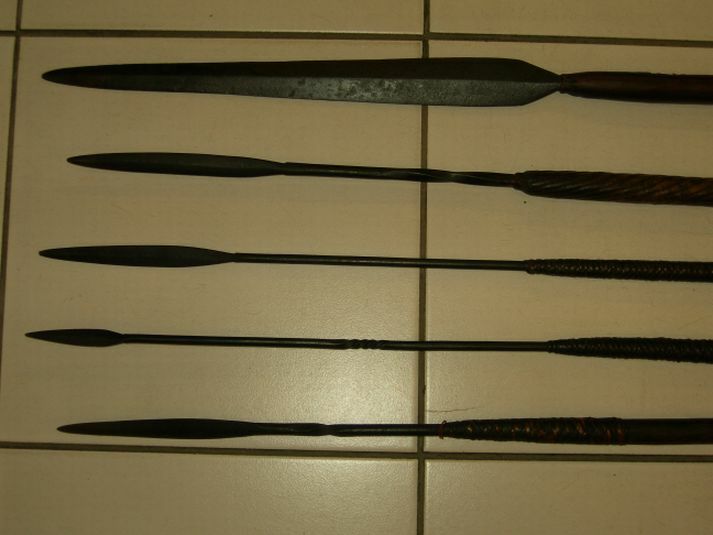 I will be posting these spears individually, but the comparison shows just how deadly the Iklwa - or stabbing spear , was. The Iklwas is on the top, an Isiphapha, or throwing spear is underneath and the others are hunting types. Second from bottom is a small headed one for birds or, small game. I never intended to make this a long, drawn out thread - but rather to add good items as they came-in. I have just purchased a small collection of early Zulu weapons and think that members will be interested in some of them. The first is exceptionally rare - an Iklwa, or short stabbing spear - it has features that show it was intended to be carried by an important person. Possibly a chief , or Induna, even a member of the Royal House. Firstly, it has a blade 20 inches long (50cm) - but , overall, it is only 42 inches (107cm) - this makes it one of the longest blades I have seen - 18" or, 19" can be found, but even they are rare. The other distinguishing feature is the carving on the end of the shaft. Zulu spears normally have a flared end - stops the hand slipping off when it is covered in blood - but only those for important chiefs have this type of decoration. The point to remember is that the spear was used as a pointing instrument to direct warriors in battle - and, therefore, the blade and end, would help identify the carrier. Age is always difficult to determine, but in this case I think we can safely say Zulu War of 1879 - or, possibly even earlier. The middle of the binding (see close-ups) was originally of cow's tail , this has either been damaged in battle ,or has worn - repairs have been made with fine quality brass and copper wire - probably from the Portuguese. I will start with this one and continue in a day, or so, with another Iklwa and two fine fighting axes. Don't be concerned about the length of this thread, it is most interesting. Zulu and British history are so entwined as to make one an important part of the other regarding South Africa. Please do keep posting. Well -I'm glad I took photos of the above Iklwa - lasted exactly 24 hours on display ! Two spears are going on today. The first is another rare , early Iklwa - this one has a nice collar of woven copper wire. It is 50 inches overall (127cm) and has a blade length of 17 inches (43cm). Nowhere as big as the previous one, but still an impressive weapon. The third one is most unusual and is not Zulu. Probably from a tribe ( Matabele - cousins of the Zulus ?) in the the old Rhodesia (now Zimbabwe) it is not a fighting spear - (although it would make an excellent one - think of Alexander the Great, his infantry carried spears - Sarissas - up to 18 feet long ) but rather has a specific use and probably for only one animal. The length overall is 6 feet 6 inches (200cm) and whilst the head is not large in proportion to the length, it is sharp and with a flared effect to the head. Obviously the length was to give an extra safety margin - so the animal must have been dangerous, a number come to mind - bush pigs; lions; leopards; large buck - but more probably elephant or, hippos. A rare item and the shaft has been well prepared. These are the final two threads to this post - perhaps more early ones will come in at another time. 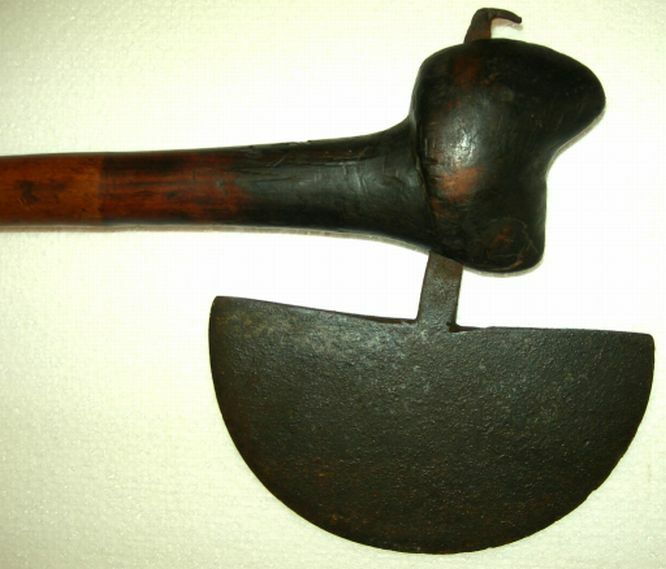 Battle Axes were only carried by Chiefs - partly status and partly because they were so expensive to buy or, have made. 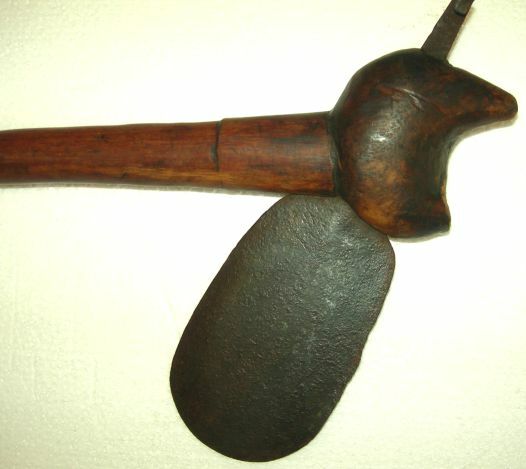 There are several different identifiable axe shapes in Southern African tribes - the Swazis, for example, use a head like two parts of a triangle. The Zulus have always used a hoe shaped head - like a half moon - and since they preferred to buy from other tribes, they are not at all common. You will see the top of each shaft finishes in a crescent (a little damaged on the smaller one) - this is very significant as the Zulus - under Shaka - perfected a battle formation that made them very succesful - even against the British. This was the Ox Horns shape. The centre of the horns was the main battle formation and the two wings , on either side, represented the horns. When battle was engaged the horns moved around the enemy - closing them in and preventing them retreating - and they then set-to to wipe them out. Lovely stuff! Every time I see that you've doena new post I say to myself "Self," I say, "time to get envious again!". I guess, like real estate, its all about location, but you seem to have the D***l's own luck as well. Lucky man! Yeah-I am perpetually stunned at what shows up. It's like having a private viewing into one of the last great private museums. With regard to 'if they could speak' - Tom raised this some time ago when he mentioned ' the washing of the spears'. This is a euphamism that the Zulus used to mean deaths each weapon has caused. We have good reason to work on roughly 10 to each one - however, the senior chief's , or Royal, example could number in the in the high tens !